Overdose Deaths From Narcotics Keep Climbing : Shots - Health News Pharmaceuticals were involved in more than half of the 38,329 overdose deaths in the U.S. in 2010. 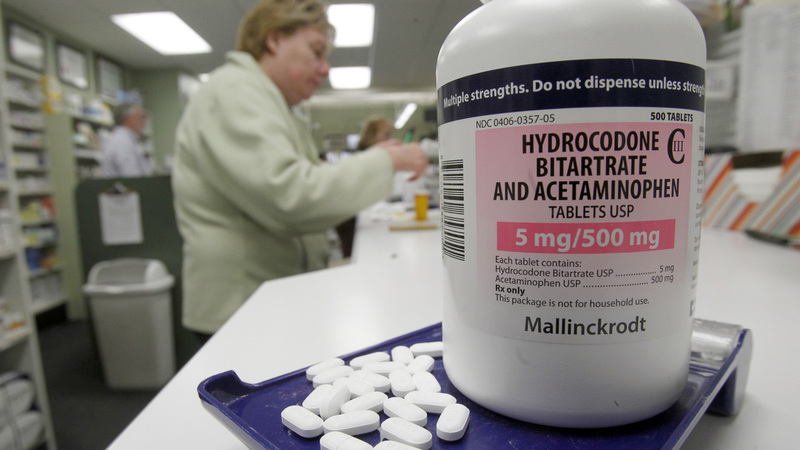 Opioid painkillers, such as hydrocodone, were the most common prescription drugs involved. But drugs for mental health conditions were also implicated often. Hydrocodone pills, the generic version of Vicodin, shown at a pharmacy in Montpelier, Vt. When the focus was narrowed to prescription drugs, the opioid painkillers were, predictably, an even clearer problem. The drugs were involved in three-quarters of overdoses. The findings appear in the latest issue of JAMA, the Journal of American Medical Association. Three-quarters of deaths involving prescription drugs were unintentional, 17 percent were suicides and the intent in the remaining 8 percent of deaths couldn't be determined. To figure all this out, researchers from the Centers for Disease Control and Prevention researchers combed through a national database containing causes of death drawn from death certificates. Because a quarter of death certificates don't specify the drugs involved in overdoses, the researchers say the findings on particular types of drugs are undercounts. While it's clear that opioids present the biggest hazard overall, drugs prescribed for mental health conditions are also involved in many deaths. Sedatives known as benzodiazepines were implicated in nearly 6,500 deaths and antidepressants in almost 4,000 deaths.